I didn't mean for it to happen, but after uploading the photo, it wound up looking like a watercolor or children's book illustration. 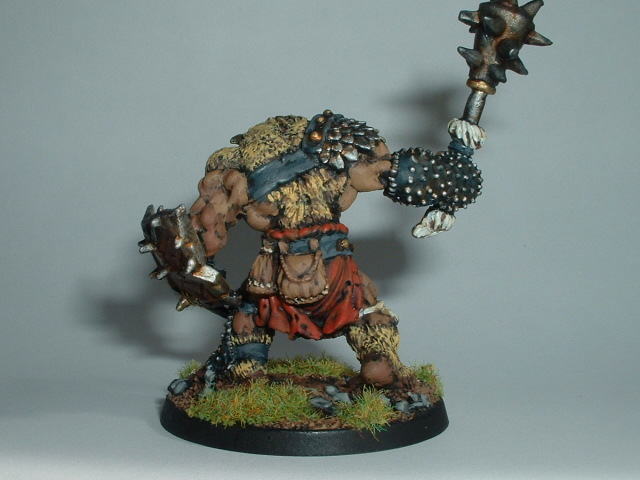 I really like the mace/spikey club- good rust effect. You have great muscle separation, but you might work on your transitions a bit. A good place to start is thinned paints and additional layers. You'll also find that glazes can work miracles (glazes are a vary large tool in my incredibly tiny tool box). Looks good. Love the base, too! I'm still new to this, but I've also found glazes to be helpful in smoothing things out. Keep it up. As said before great job on the mace, it looks very real. I also like the color you chose for the loincloth. Hamish, I dig the color illustration look. You reproduce that on demand and you just might start a trend. Cel-shaded Miniatures! Geez , he came up really well . Nice job ! Agreed. As it happens the look is appropriate for the bugbear given that his illo back in the 1E MM was fairly cartoony. 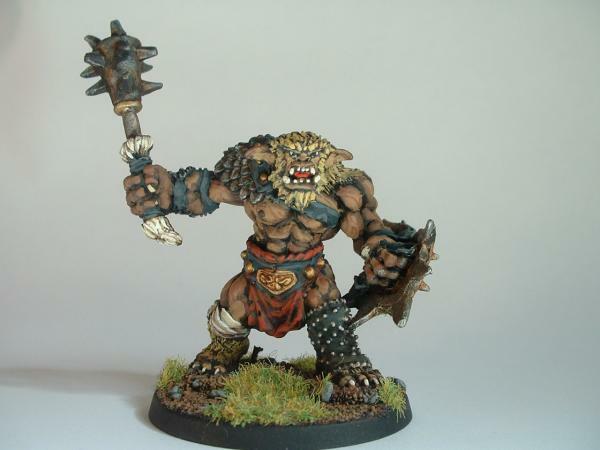 The 40MM base is also justified by that book since the bugbear was a large creature back in the day, rather than medium. I have all the other Reaper Bugbears, and they will fit on a 25mm base, but this guy is about 50% bigger than any of the others, and just about needs the larger base. :) I guess he is the bully of the tribe. If you put him next to one of the others, like the new female bugbear cleric, you can see the scale difference. Heh, this is probably the first blond bugbear I've seen. Looks really cool; I'd say he came out quite nicely & the photo looks fine to me as well. How about a shot of the back? I'd also be interested in seeing a photograph of the size comparison to other Reaper bugbears you mentioned, if photos are available and you're not too worried about it dragging your thread off-topic, as I have several of those other older bb's on my desk as well and am considering buying one of this guy to help fill out the set. I like the look..the childrens-book look as you say. Believe me, when I sit down and finally write that great American childrens' book about orcs and the like, I'll call ya. The best parts in my opinion are his rusty mace, his red loincloth, and that little bronze-looking bit of armour on front of his loincloth. Great job on the white fur round his mace handle too. Yeah..let's see that BOOTY SHOT!! 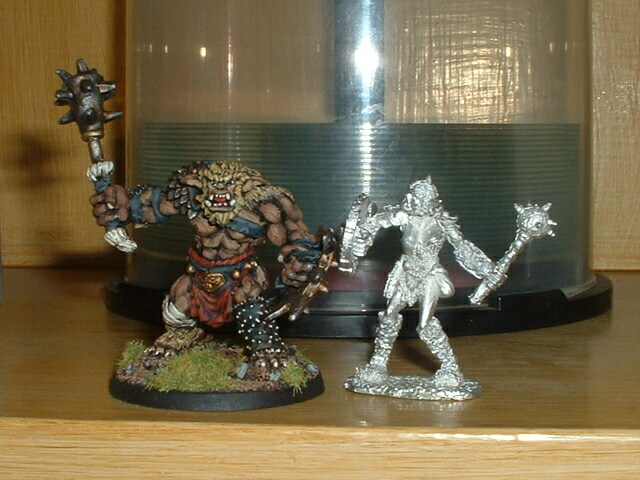 Here's a comparison photo with the female bugbear cleric. As you can see, he's a great deal bulkier. His base goes from edge to edge on a 40mm base. Yep...he's a bit more meat-'n-taters and she's more like salad-bar. Still they're not too out of scale. She's just dainty and petite....and she gets a smaller mace. If she were a liberated bugbear, she'd demand an equal weapon too. I too would like to see the back. Love to see how you did the little fanny pack he's got back there and such. Allright, here's a booty shot of the bully. I actually like the way he looks. yeh He was a bit big but Ron asked for a behemoth, Alpha male type and voila.... The base size was a bit of a flub on my part, but then again the smaller the base the more restricive the pose and such. I REALLY like the colors you chose for him as well.